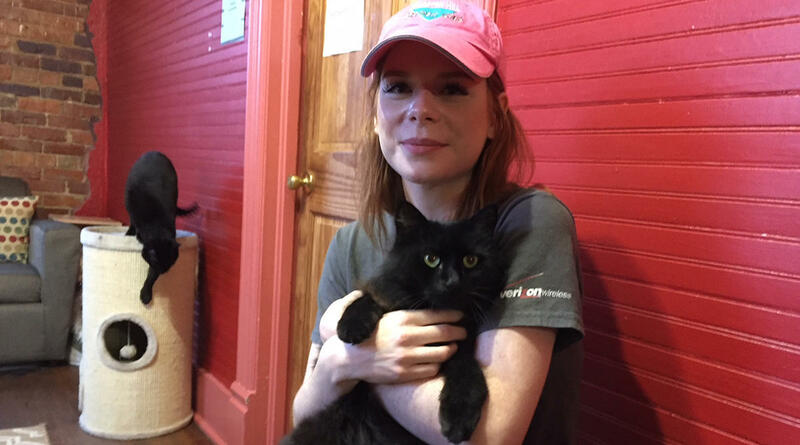 Emily Hughes cuddles with one of the two-to-three dozen friendly felines to be found at the cat cafe in West Columbia. She finds hanging out with the animals a stress reliever when she can't get home to Eastover to see her own pets. The idea is that customers can come in to have a cup of coffee or other drink and a snack, and then go upstairs to visit numerous cats that not only are friendly and companionable, but also up for adoption. Students at the nearby University of South Carolina find the couches and desks a relaxing place to study, and petting furry friends that they can’t have in their dorms makes it all the more homey. Co-owner Maria Garcia says that petting cats is therapeutic. “Mine is registered as an emotional support animal,” she adds. USC student David Varney finds visiting the place “a breath of fresh air” and a fun alternative to activities like going out to bars or the movies. Pre-med student Meghan Adams is a member in the café, which gives her low admission and other perks, especially, of course, lots of time with the cats as she studies. The concept started in Japan in 2005, and is gaining such popularity that Ortega can envision himself opening more cat cafes in the Midlands in the future.